Step up your burger game with these spicy beef patties. Inspired by Vietnamese bánh mì sandwiches, the burgers are topped with mayonnaise and a slightly sweet-and-sour slaw and served on crusty rolls. The beef is mixed with a potent mixture of chipotle chiles, red onion and mustard, resulting in a tender, flavorful burger. Use a spiralizer to cut the cucumber and carrots, then quickly pickle them in vinegar and a little salt for that perfect crisp-tender crunch when you bite into them. For an extra kick, mix the mayo with a squeeze of Sriracha or other chile sauce! 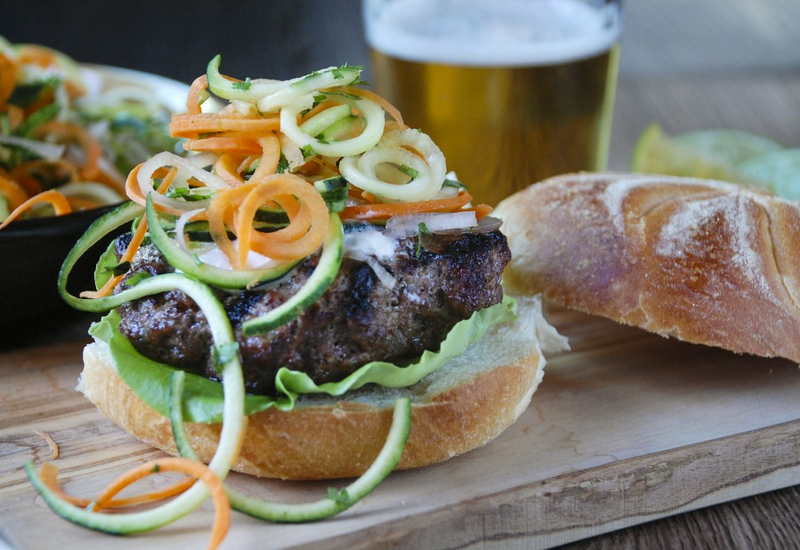 Serve the burgers on crusty ciabatta or kaiser rolls instead of hamburger buns to further evoke the bánh mì experience! For a lighter option, skip the buns altogether, and serve the burgers and slaw with bibb lettuce leaves to make beef lettuce wraps. Per Serving: 602 calories; 37g fat; 28.0g carbohydrates; 38g protein; 153mg cholesterol; 1288mg sodium. I was craving a burger and since I have been going crazy with my spiralizer lately, I decided to give this one a shot. I took into consideration the previous review and bumped up the amount of chipotle in the meat. This was very interesting and as I kept taking bites, it grew on me. The only thing I will say I would probably do extra would be to add some sort of cheese, but sour cream works giving a layer of creaminess needed in this burger. I will try this again with a mix of beef and ground pork. I am normally a salt and pepper only kind of burger person - but this recipe caught my eye since i just bought a new spiralizer. Really great flavor... I added cheddar cheese... the slaw is a totally cool new way to use my spiralizer. Will def make again. These tasted awesome. I used blue cheese to amp up that umami flavor that I love. I love a good burger and THIS is a Great burger! I'm a sucker for slaw on a sandwich, usually I have slaw on Chiken sandwiches but it works awesome here with this chipotle burger. Also a perfect excuse to whip out my Mealthy Spiralizer and make quick work of those veggies. Give this one a shot! These burgers were fantastic. The spiralized slaw was really easy to make. My spiralizer saved me so much time from trying to shred the veggies. The only thing I changed was I used 2 chipotle peppers instead of one to make it spicier.